A vintage-style flower diamond ring for women crafted in pure 14k white gold. 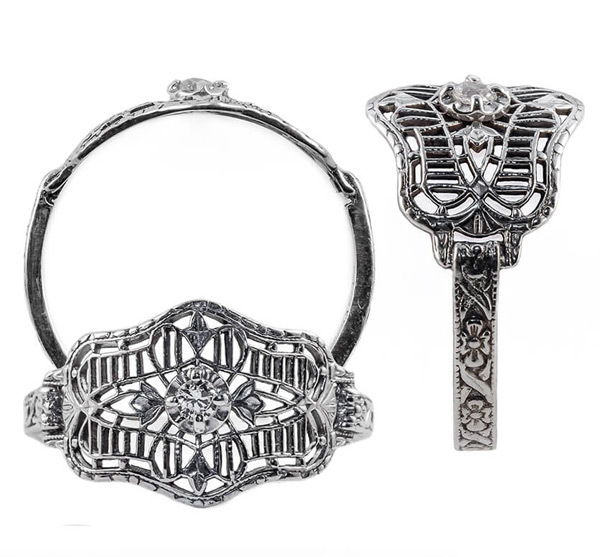 What makes this vintage flower ring unique is that these are original rings from the 1800s which our designers procured and we make our rings as an exact replica from the originals! 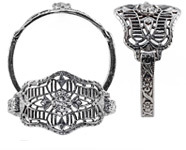 These are not merely the imaginative reproductions of a jewelry designer, but an exact replica of the exact ring worn during the circa 1800s period. The vintage flower ring is set with a 0.06 carat white diamond in H-I Color, SI Clarity. Also available in white topaz and sterling silver, shown below. While it is not pictured in yellow gold, we do also have our vintage flower diamond ring available in yellow gold by request. This ring is handmade in the U.S.A.! We guarantee our Vintage Flower Diamond Ring for Women in 14K White Gold to be high quality, authentic jewelry, as described above.